If you have sensitive skin, you need to shop for safe products that won’t cause harm or irritation. The last thing you need is to aggravate your earlobes if they are already red, itchy, sore or bleeding. These are all symptoms of severe jewelry allergies. If you can’t comfortably wear a pair of regular earrings, the odds are that you’re having an allergic reaction to nickel. Nickel is part of the metal used to make most jewelry today. Fortunately, hypoallergenic jewelry is an alternative. Hypoallergenic earrings provide you with comfort and add sparkles to your sensitive ears. However, you need to take your search for that perfect earrings one step further and purchase nickel-free earrings. First, keep in mind that earrings labeled “hypoallergenic” aren’t automatically safe for you or your child to wear. When earrings are hypoallergenic, it means that it causes fewer allergic reactions. It doesn’t eliminate them. Your skin might still feel irritated even with these earrings. That’s because calling a product hypoallergenic doesn’t require the manufacturer to meet any set standards. For example, California has a Metal-Containing Jewelry Law, but it only restricts the use of cadmium and lead in jewelry, not nickel. Only in the EU are there exacting restrictions on the use of nickel in jewelry. Jewelry imported to and sold in North America does not have to meet those standards. That leads us to the reason you need to seek out nickel-free jewelry. When you see "nickel-free" written on the label, chances are your skin will not react to it. Hypoallergenic earrings may not have any nickel on the surface of their posts, but they may have nickel under the coating. If it scratches or wears off, your skin touches the nickel. Most bargain or fake jewelry looks cute when it’s new, but their finishes are generally thin and scratch off easily, exposing the nickel underneath. That’s when your ears start developing those unpleasant allergic symptoms. If you want to buy pure gold or silver jewelry to avoid nickel, it doesn’t exist. Gold and silver are too soft in their pure forms to hold up as jewelry. That’s why they alloy other metals like nickel to add strength and color. Gold plating is an option, but not the best one. Under the plating, the base metal contains nickel which can wear away with time and regular use. The nickel underneath could cause an allergic reaction to your skin. Your best choices for nickel-free, hypoallergenic materials in jewelry are titanium and medical grade plastic. They are both versatile, durable and comfortable to wear. Most importantly, designers can make beautiful earrings and other jewelry from them. You can’t go wrong when you wear medical grade jewelry. It’s designed to protect your skin, allowing you to wear it all day and night if you like. That’s a big deal because most people wear their earrings while going about their daily activities such as exercising or swimming. Titanium earrings provide comfort and style without causing the body any distress. It is harmless and used in a wide range of medical implants and devices. If it’s safe to use inside your body, you can rest assured that it’s okay to wear on the outside. You might read “plastic” and wonder how it applies to elegant, hypoallergenic jewelry. The truth may surprise you. 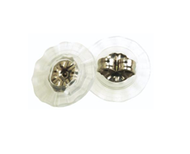 Medical grade plastic earrings are naturally nickel-free, ensuring safe, long and comfortable wear. They are available in many styles and colors to suit your unique personality. Medical grade plastic makes the best earrings for kids because it won’t cause jewelry allergies and it’s very durable. Consider nickel-free, medical grade plastic studs to start a safe and beautiful earring collection for you or your baby. If you love gorgeous jewelry, you’ve come to the right place. Blomdahl USA is the leading manufacturer of hypoallergenic earrings and nickel-free jewelry. If you need to feel comfortable, confident, and stylish but have sensitive skin, we have the best nickel-free, hypoallergenic earrings available. Browse our catalog today.